Spring is behind us and we are heading into the wonderful summers we have on the Highveld. Afternoon showers have been somewhat dramatic but nevertheless beneficial to our gardens. Be adventurous this summer and try some new ideas in the garden. Firstly some suggestion on fruit trees. We always think they are going to be a hassle and yet you can have such fun and rewards from growing your own. I use apples in many of my gardens and we espalier them down narrow passages alongside the house or in back courtyards where there is usually just hard paving. To be able to harvest your own apples and share them is extremely rewarding. 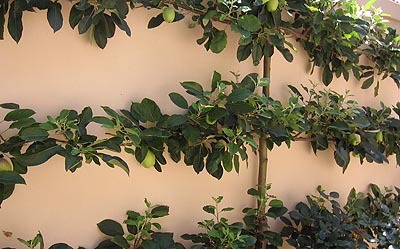 You can also espalier an unusual tree like a Persimmon or a lovely black Fig. Maintaining these are also not difficult and you can treat them totally naturally and organically without having to use toxic pesticides like Lebaycid. The most important thing to remember when maintaining is to be consistent with your applications of ‘home made remedies’ and companion planting. Grow some unusual veggies like Beefsteak Tomatoes, Strawberry Popcorn, Yard long beans, Inverted Radishes or white Bringals. We have seed suppliers in South Africa that you can buy these directly from. Then watch out for some of the new varieties of perennials that come in each year. The princess range of Alstroemeria which is a such a nice plant for smaller gardens. You can also have a variegated leaf variety and they are so rewarding. Pensteman is an old fashioned plant which is so pretty in the garden. Many new Day Lilies and if you are clever you can ask for a few different varieties so that you have flowering for much longer. Salvia’s are ever popular and are wonderful fillers. They come in deep glorious blues, whites and the indigenous ones are reds or orange. • Watch the watering as some days are so hot. Don’t water in the middle of the day, rather later in the afternoon and put your automatic irrigation on to about 8 p.m so that you get good soaking during the night. • Walk around the garden and look up into the trees. Check that they are happy and not too much ‘woody’ bits inside. Open them up and enhance the beauty of the canopy and let more light in under the trees so that the plants are much happier.